Thursday is here and that means a 150% bonus pre-weekend celebration at Slots Capital Casino with an extra $25 free chip Sunday reward! Redeem the coupon code 150WEEKEND before your next deposit of $35 or more to claim your 150% bonus today and you will also get a $25 free chip to play on Sunday. 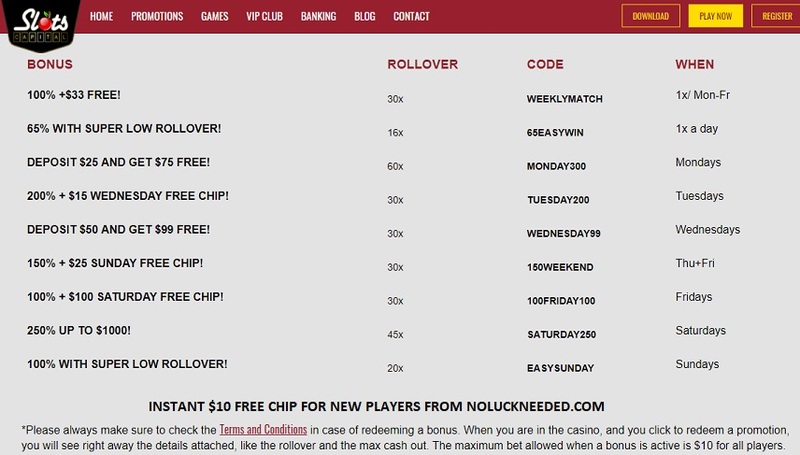 New players will receive an instant $10 free chip sign up bonus after creating an account via NoLuckNeeded.com Good luck! Valid on Thursdays. Terms and conditions apply. No max cash out attached. Minimum deposit is $35. 30 times rollover attached to the bonus. Playable on Slots, Scratch Cards and Keno. Additional rules or max bet may apply, check the cashier or website. The maximum bet when a bonus is active is $10. Please mind the max bet rules. The maximum bet allowed when a bonus is active is $10 for all players. Available only until 17th of February. Terms and conditions apply. Minimum deposit is $35. 45 times rollover attached to the bonus. Playable on Slots, Scratch Cards and Keno.